You’ve worked hard to craft a variety of delicious beers. You’ve mastered kegging your homebrew. After all your blood, sweat, and tears, why would you stick your exceptional brews into a battered, old mini fridge covered in bumper stickers? You’re better than that. Your beer is better than that. Build yourself a keezer—a chest freezer turned kegerator. You’ll be able to keep several kegs cold and on tap at once. Plus, you’ll be able to fully customize your keezer so it looks much classier than that dorm room castoff. If you keg your own homebrew, why not serve it in style with a custom keezer? You’ll find a lot of instructional articles and videos online telling you how to build a certain style or size of keezer. Some steps will be individualized depending on your setup. For example, you may decide to place all your taps on the front, or put some on the sides. If you place them on the sides, you’ll need to drill holes in the appropriate spots and possibly need a bit extra beer line length. But the basic construction of a keezer is similar whether you’re starting with a 5-cubic-foot or 8.8-cubic-foot chest freezer If you click this link and make a purchase, we earn a commission at no additional cost to you. . The parts and tools you’ll need are also pretty universal, so if you’ve already built some homebrewing equipment yourself, the list of components will look familiar. Chest freezer If you click this link and make a purchase, we earn a commission at no additional cost to you. : When choosing a size, consider how many kegs you want it to hold, and where you want the carbon dioxide (CO2) tank stored. CO2 tank If you click this link and make a purchase, we earn a commission at no additional cost to you. : This necessary component for pouring your beer can be stored inside or outside your keezer. Decide where you’ll put it before choosing a freezer size. Kegs If you click this link and make a purchase, we earn a commission at no additional cost to you. : You want beer in your keezer, right? Well, you can’t just pour it into the freezer! Lumber: The exact lengths of 2x4s you’ll need will depend on the size freezer you’ve chosen, the size of the hinges on it, and whether you wish to attach the lumber to the freezer’s body or lid. Saw If you click this link and make a purchase, we earn a commission at no additional cost to you. : You’ll need to cut the lumber to fit the freezer. Remember the old saying: Measure twice, cut once. 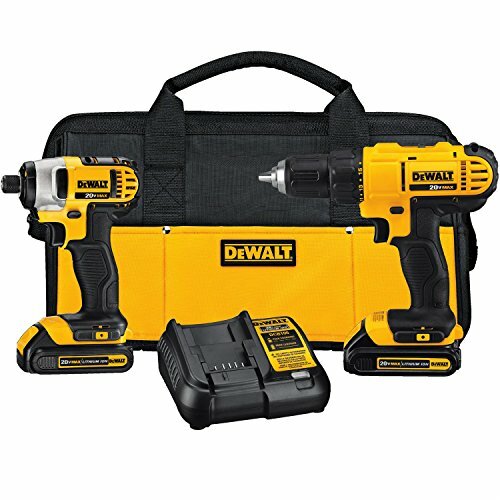 Power drill and driver If you click this link and make a purchase, we earn a commission at no additional cost to you. : You’ll be working with screws and drilling holes in the collar. Wood putty If you click this link and make a purchase, we earn a commission at no additional cost to you. : After drilling holes, wood putty will add stability for the hardware you install. Spade bit set If you click this link and make a purchase, we earn a commission at no additional cost to you. : To drill proper holes for taps, choose the bit size that corresponds to the beer shanks’ external diameter. Typically, you’ll need a one-inch spade bit, but measure before drilling. Wood screws If you click this link and make a purchase, we earn a commission at no additional cost to you. : Long enough to properly secure the collar pieces at the corners. Silicone sealant If you click this link and make a purchase, we earn a commission at no additional cost to you. : Choose one rated for use in damp environments and cold temperatures to avoid cracking and leaks. 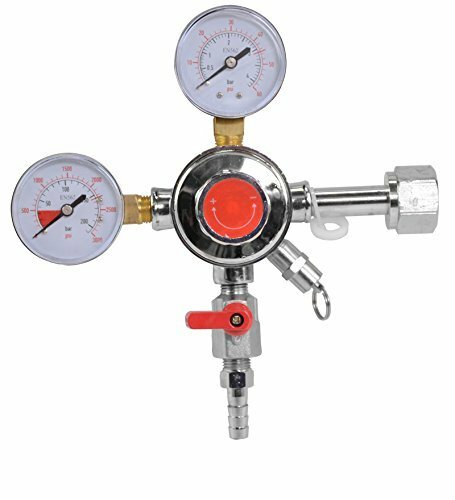 Dual gauge CO2 Regulator If you click this link and make a purchase, we earn a commission at no additional cost to you. : Displays the pressure in the CO2 tank and in your keg. 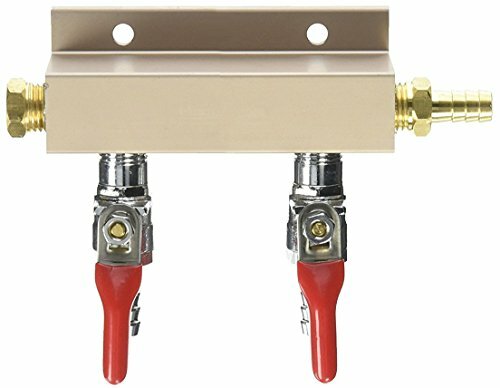 CO2 Distributor manifold If you click this link and make a purchase, we earn a commission at no additional cost to you. : Choose the correct size by how many ways you’re splitting the gas line. For example, a four-way CO2 distributor accommodates four kegs. Gas tubing If you click this link and make a purchase, we earn a commission at no additional cost to you. : Whichever size you use, be sure all other hardware properly accommodates the tubing. Quarter-inch or 5/16-inch inner diameter (ID) beverage tubing is often used for gas lines. Beverage tubing If you click this link and make a purchase, we earn a commission at no additional cost to you. : For most keezer builds, 3/16-inch beverage tubing will work well to minimize foaming at the tap. Hose clamps If you click this link and make a purchase, we earn a commission at no additional cost to you. : Be sure the clamps you purchase fit over the gas and beverage tubing. You’ll need two of these per hose for both gas and liquid sides. If you’re hooking up four kegs, you’ll need at least 16 hose clamps. It’s best to have a few extra on hand in case any get mangled while you’re clamping them down. Ball lock disconnects If you click this link and make a purchase, we earn a commission at no additional cost to you. : You’ll need twice as many of these as you have kegs, a gas side and liquid side disconnect for each keg. Barbed swivel nuts If you click this link and make a purchase, we earn a commission at no additional cost to you. : These must also match the hose size you’re using. Stainless steel beer shank assembly If you click this link and make a purchase, we earn a commission at no additional cost to you. : Measure the length between where the faucet will be and the beer line (the width of the collar) to choose the correct length shank. Remember, you’ll need one for each keg. Beer faucets If you click this link and make a purchase, we earn a commission at no additional cost to you. : This may or may not be part of the shank assembly, depending on the set you choose. You’ll find several styles to choose from, such as flow control, stout style, and self-closing. Remember, you’ll need one for each keg. Tap handles If you click this link and make a purchase, we earn a commission at no additional cost to you. : You can go as plain or flashy as you want to with these, just make sure they’ll fit without smacking into each other when you pour a beer. Using your lumber, you’ll build a rectangular frame, then install it on top of your deep freezer using waterproof silicone sealant. Measure the perimeter of your deep freezer from edge to edge. Cut the boards to meet the freezer edges. Set them in place to ensure they line up correctly. Choose which piece will have the taps installed on it, then measure and mark where you want the tap holes. Leave a few inches between to keep the handles from hitting each other. Drill the tap holes using the spade bit. Assemble the collar using at least two wood screws per joint. Drill lead holes to help prevent splitting. Use wood putty to fill any cracks or gaps. When dry, sand it smooth. Paint, stain, or varnish the collar, and allow it to dry thoroughly. Apply sealant around the top of the freezer, then carefully press the collar into place. Immediately wipe away any excess sealant. Allow the sealant to dry per product instructions. This may be two or three days. be patient! While waiting for the sealant to fully set, you can get the lines ready to go. First, work on the gas lines, then the beer lines. Choose where you’ll install the CO2 distributor, then measure from there to where the CO2 canister will be (inside or outside your keezer). Cut a length of gas tubing to reach between the CO2 distributor and the canister. Include a little extra so the line has some give and won’t be pulled taut. Slip a clamp over each end of the tubing. Insert a swivel nut, then tighten the clamp to secure it in place. Do this on both ends of the line. Attach one end to the gas side of the distributor. Attach the other end to the CO2 regulator, which will eventually be connected to the CO2 canister. Measure and cut lengths of tubing to reach from the distributor to each keg. You’ll want a little extra so you can maneuver the lines around when changing kegs. Slip clamps on both ends, then install swivel nuts. Put a ball lock disconnect on one side, then tighten the clamps to secure them. Attach the other end of each line to the distributor to complete your gas line assembly. Start the liquid side by measuring and cutting lengths of beverage tubing to reach from each keg to each tap. Again, allow them a little give. Slip a clamp over the end of the line, then a ball lock. Tighten the clamp to secure. Repeat on one end of all the beverage lines. On the open end of each line, place a clamp, then the wing nut and tail piece from the beer shank assembly. Tighten the clamp, and the liquid lines are ready for installation. Let’s get this thing ready for a few kegs. If possible, complete your keezer build in or near the spot where it’s going to live so you won’t have to move it when it’s full of kegs. That’s just a backache waiting to happen. Install the beer shanks through the holes in your keezer collar, with the faucet connectors facing outward. Insert a washer into the beer shank wing nut on one of the liquid lines, then screw the nut onto the back end of the beer shank. Repeat for all the liquid lines. Close the CO2 distributor valves. Attach the distributor inside the back of your keezer collar using wood screws. If your CO2 will be stored outside the keezer, drill a hole in the collar, and run the CO2 line from the distributor, through the hole. You’ll need to temporarily remove the CO2 pressure regulator from the line before passing it through your keezer collar. You may choose to keep your CO2 inside the keezer with no problems. Put the deep freezer lid on top of the keezer collar. Attach the freezer hinges to the lid using the original holes and hardware. Mark and drill holes into the collar where the hinge must now be attached. Insert screws to secure the hinges into your keezer collar. Check to make sure the lid functions properly. Screw the faucets into the beer shanks. Install the tap handles. Tighten all the hose connections to prevent leaks. Place your keezer where you want it, then set the temperature. Flush some cleaner through the beer lines before you hook up your kegs. Put your kegs in your brand new keezer. Hook up the gas and liquid lines. Turn on the gas distributor valves and CO2 tank. Or maybe you’re not quite done. Sure, you’ve got an insulated box with a few kegs inside and a few taps sticking out the front. Now it’s time to make it awesome. Dehumidifier: Condensation can become a problem in a keezer, especially if yours is in a warm environment, such as the garage during summer. 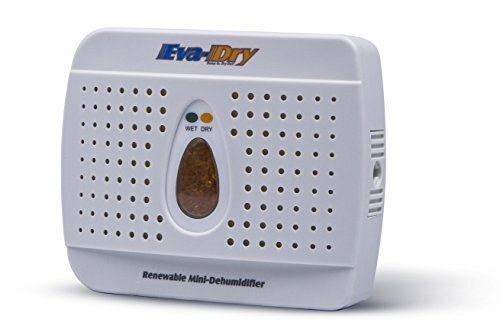 A mini dehumidifier If you click this link and make a purchase, we earn a commission at no additional cost to you. is the perfect fix. Fan If you click this link and make a purchase, we earn a commission at no additional cost to you. : If the top of your keezer is too warm, you may want a little help circulating the cool air so it won’t settle on the bottom. Installing a fan on the collar can help. Custom tap handles: You can find handles with a little extra personality, such as white board and LED tap handles If you click this link and make a purchase, we earn a commission at no additional cost to you. . You can also find engraved and molded handles made by artisans. Tap handle options are really only limited by your budget and imagination. Specialty Paints: Think much further than what color you want your keezer to be. You can get paint to turn a white, rusty old freezer into a chalkboard If you click this link and make a purchase, we earn a commission at no additional cost to you. , stainless-look, or whiteboard If you click this link and make a purchase, we earn a commission at no additional cost to you. . Using magnetic primer If you click this link and make a purchase, we earn a commission at no additional cost to you. underneath will maintain the ability to use magnets, despite thick paint layers. You can even use peel-off paint called custom wrap If you click this link and make a purchase, we earn a commission at no additional cost to you. if you want a make temporary designs on your keezer, like a new beer flavor logo. Your ideal keezer might be a minimalist, stainless box with sleek black tap handles or a massive chalkboard covered in custom art with LED tap handles. However you personalize the outside of your keezer, be sure to build it using quality components for function and longevity. Remember to check all the connections after you build it to prevent leaks, and inspect them on a regular basis as well. Of course, keep the lines clean to get the best possible tasting beer for all those people you’re going to have over to check out the awesome keezer you built.